Suppliers´ margins have decreased for the last couple of years, due to higher material and labour costs, rising competition and pressure on sales prices. According to the German Automotive Association VDA, the production of German passenger cars again increased in 2015, by 1.3% to 15.1 million units. Domestic production increased 1.9%, while production abroad rose 1.0%. Turnover of the whole German automotive industry (producers and car part suppliers) increased 10% year-on-year. In the period January-August 2016 domestic car production grew 2%, while new car registrations in Germany rose 6%. 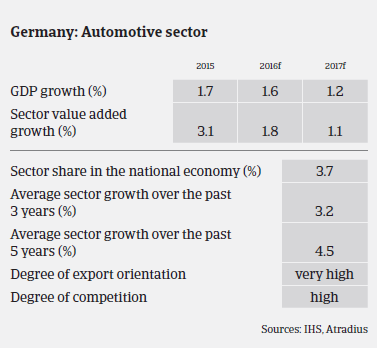 This underlines the continued robust performance of the German automotive industry. German automotive suppliers are still making good profits and, in general, their solvency and liquidity are robust. However, margins have decreased for the last couple of years, due to increased material and labour costs, rising competition and pressure on sales prices. At the same time, suppliers have to invest in engineering/production branches overseas in order to be close to original equipment manufacturers (OEM) that have relocated abroad. High capital expenditures in research and development are necessary to stay ahead of competition in new trends and technologies, i.e. electric motors, connected driving, autonomous cars. In order to stem necessary investments, increasingly size matters. Therefore, the concentration process in the German suppliers segment is on-going, while dedicated technology companies are entering the automotive market. The overall indebtedness of the automotive sector remains manageable and banks are generally willing to provide loans to automotive businesses. Our view of payment behaviour in the sector has been good over the last two years, with no increase in the number of non-payment notifications in the past 12 months. 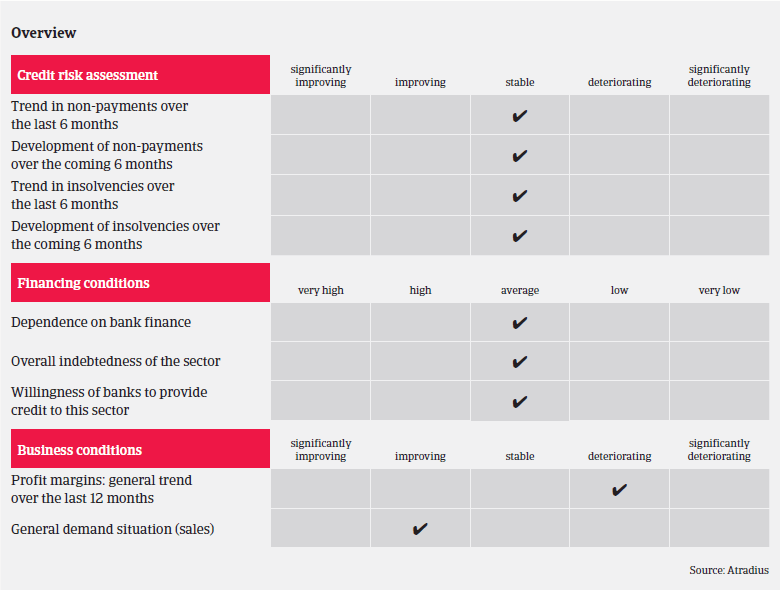 We expect the level of non-payments and insolvencies to remain stable or even to decrease slightly in the coming months - provided that the currently shaky international economic environment does not deteriorate further, and the economic rebound in the eurozone continues. 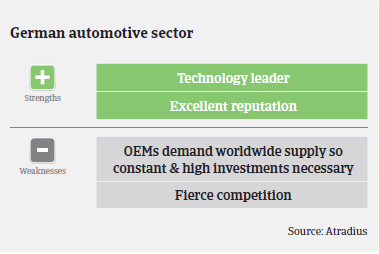 Given the still benign business outlook for the automotive sector, our underwriting stance remains reasonably relaxed, as it was in 2014 and 2015, especially for larger-sized, well-established suppliers, who usually have good access to capital markets and face a very low default risk. That said, there are also a large number of small companies in the supplier subsector, which could face higher business and credit risks in the future, due to low leverage in negotiations with OEMs or if OEMs stop ordering from them (delisting). At the same time, competition is fierce in some segments. More than 50% of chassis manufacturers and electronic component providers generate revenues of less than EUR 50 million. Many small businesses have difficulties funding the investment necessary for further growth or to climb up the value chain. Those structural weaknesses are exacerbated by the fact that the automotive market performance is highly dependent on volatile factors, such as global political and economic developments (consumer spending and consumption attitudes), raw material prices, and currency exchange rates. While the current performance of the German car industry is still solid, any deterioration in economic performance and consumer sentiment would have direct and immediate negative effects on automotive sales, hitting mainly smaller suppliers. Given the structural vulnerability of those players, we rate the German automotive sector as “Fair”. The general outlook remains positive, and margins are relatively high, especially in niche segments. However,competition from China is increasing. 93.0% of respondents in Germany experienced late payment of invoices by B2B customers over the past year. This in spite of very strict payment terms.